Mab (left) and Titania (right) on their final day before treatment/destruction. The floorboard is inserted in the Titania hive, with rags on it to absorb petrol. A sheet of cardboard is underneath to catch leaks. Bees come and go at the time of the photograph, but at dusk the Titania hive was taped closed. Prime suspect: the incoming swarm of Queen Titania. EFB infection was barely detectable by eye in that colony, but the brood pattern was “spotty” - a mix of empty and full cells - an indication that the bees were removing larvae. This “hygienic behaviour” clears out infected brood and is therefore good, but it makes the disease more difficult to diagnose. The colony were perhaps living with EFB long term, and perhaps came from a strain relatively well adapted to it. Queen Titania’s hive sat between Queen Mab’s on one hand and Queen Storm’s on the other - both of them were also infected. So, according to Theory A, Queen Titania’s swarm brought EFB with them to the apiary, and the disease spread from them to the neighbouring hives via bee drift and/or beekeeper activity. In support of Theory A, there is recent history of EFB in the local area. The season before my bees arrived, a local swarm was caught here and discovered to have EFB. Infection has also been found in another apiary here this summer. However, Theory A alone does not account for all the facts. EFB has been found at the orchard, in Queen Boudicca’s colony. Boudicca is Mab’s daughter, which strongly suggests Mab’s colony were carrying the infection in the orchard when the split was made. According to Theory B, the bees of Queen Mab’s colony (the worst afflicted) went visiting other beehives in the spring when they were living at the orchard. They ate infected honey and brought the infection to their colony. We then brought the bees here, and the infection spread from Queen Mab’s colony to Queen Titania’s and Queen Storm’s. In favour of this theory is the finding of EFB in Queen Boudicca’s colony at the orchard, and the colonies’ previous good health which suggests the infection is not a long-standing one. Against it, there is no history of EFB in the orchard area. This is our Bee Inspector’s leading theory. CB4, where the hives were until last autumn, is a known disease hotspot. 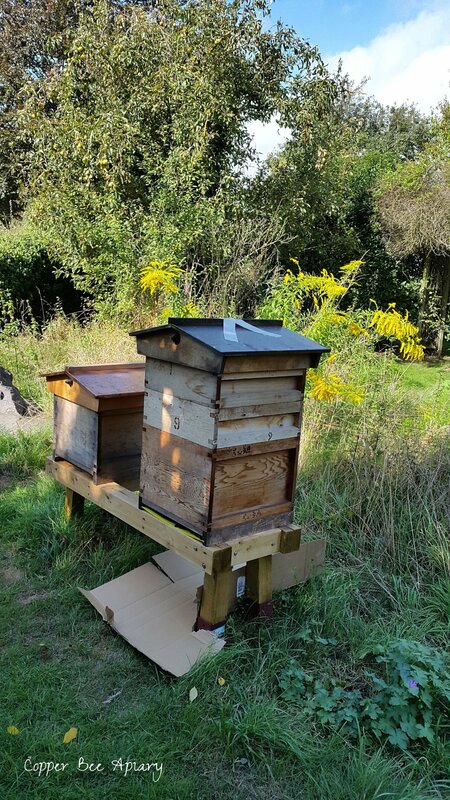 And although we had a healthy inspection report from the local Bee Inspector last summer (and previously), EFB is asymptomatic in its early stages. So according to Theory C, the bees caught the infection in CB4 last year, and brought it with them via the orchard to here, where it finally revealed itself. The NBU’s labs should give us the genetic test results within a couple of months (they have quite a backlog apparently), which may identify a link between “our” EFB and previous cases, allowing its geographic origin to be determined with more evidence and less guesswork. Of course, more than one of A, B and C might be true. A does not account for Boudicca’s infection, and C does not account for the infected local swarm found in this area before my colonies arrived. Queen Mab’s hive, treated with antibiotics, now stands alone.